1. Heat oil in large skillet or wok over medium-high heat until hot. Add bell pepper and onion; cook and stir 2 or 3 minutes or until vegetables are crisp-tender. Add tomato, salt and pepper; cook until thoroughly heated. 2. To serve, place 1/2 cup of the vegetable mixture in center of each warmed tortilla with desired toppings. Fold or roll up. 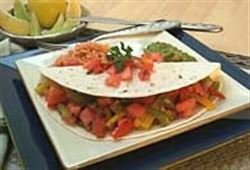 Enjoy this delicious vegetarian fajitas Mexican recipe!